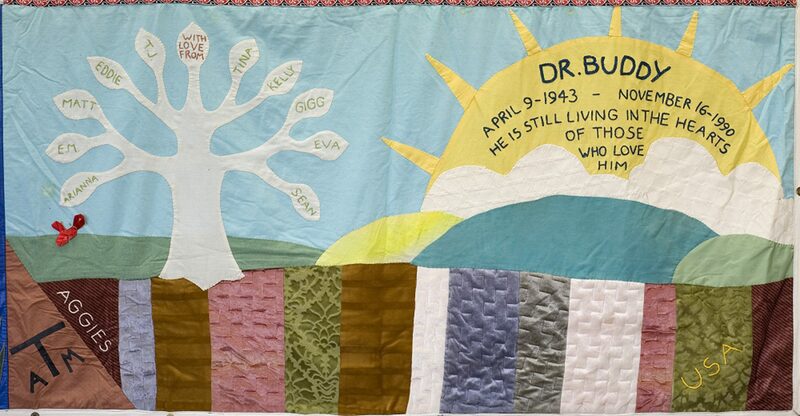 This panel was created by volunteers of the NZ Quilt Project as a result of a request. The tree is a spiritual tree with the names of all those who will remember. Arianna’s tribute to Dr Buddy. Dr Buddy was born on 9 April 1943 and died on 16 November 1990. He graduated from Texas A & M University with a degree in veterinary medicine and loved animals and children. He loved horses, dogs, birds, mules, and peacocks. He was a man that had a very big heart and cared about everyone. In his first marriage, he had two children, Matt and Eva. He was remarried to Tina who had two children, Eddie now 17 and Kelly 14 (in 1993). Tina and Dr Buddy also had a child, T.J. who is now 9 (in 1993). The maroon, white and black in the Quilt represent the school colours of Texas A & M which Dr Buddy was so proud of.